As a diesel engine logs hours, its fuel warms. Along with that, and the heat of the sun, diesel fuel's ability to absorb water increases. Condensation, humid air and contaminated fuel supplies are all culprits. Over time bacteria grows in the water and also the water corrodes fuel tanks and steel lines. 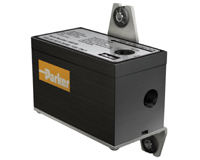 One solution to the malady is the Parker Energy Systems Fuel Polishing Module that filters up to 50-gallons of fuel per day, removing emulsified water from diesel, bio-diesel or kerosene. Besides water, it also removes sediment, which is essentially the corpses of microbes that have lived and died in the fuel. These are corpses killed by biocides. How diesel fuel polishing works is as simple as the sea is salt. During engine downtime, or during the off-season, the Parker Energy System FPM-050 re-circulates fuel through existing Racor filters. The solid state pump draw fewer than two Watts of electricity at 12 Volts (DC), a low enough current draw so that it can be powered by a solar panel. Cost is $587 (suggested retail). The good news gets even better. 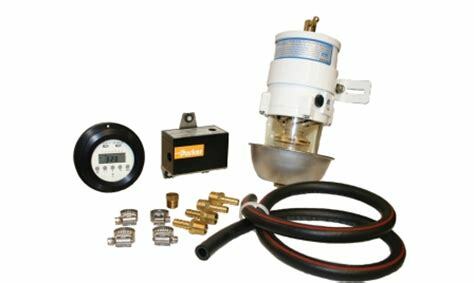 Diesel fuel polishing can be programmed with a timer that automatically re-circulates fuel. Daily fuel maintenance keeps it dry. As many as 56 weekly switching cycles and up to eight distinct cycles per day can be scheduled. Its lithium ion battery last for up to five years. The timer costs $239 (suggested retail).